Negativity can ruin your life. It can skew your view of others, lower your expectations, and blind you to blessings. Proverbs 11:27 says “if you search for good, you will find favor. If you search for evil, it will find you.” There is suffering in life. We are made stronger by our struggles but the things we struggle against can also become stronger against us if we approach them without faith. There is an old saying about waiting for the other shoe to drop. The phrase originated, as far as I can tell, from early apartment buildings where a person could hear their upstairs neighbor take off his shoes. When he heard the first shoe drop overhead, he knew the next one was coming. The phrase has become associated with expectation and is often used to describe someone who has had a bad experience and is waiting in expectation for the next bad thing. Do you know people who live life waiting for the other shoe to drop? Are you such a person? If there is anything that I dislike in life, aside from english peas, it is a defeatist attitude. If you search for evil, it will find you. Similarly, if your expectation is for the next misfortune, you will find it. Good things and bad things happen in life, for all of us, but the defeatist tends to overlook the blessings. Gratitude is important in a life of faith. Don’t be a victim. Of course the man wanted to be healed but, I think, he was a defeatist. In answer to Jesus’ question he replied: “Sir, I have no one to put me into the pool when the water is stirred up, and while I am going another steps down before me.” Scripture tells us the man had been ill for 38 years. The back story about the pool tells of a legend. It was believed that an angel appeared at the pool periodically and stirred the water. 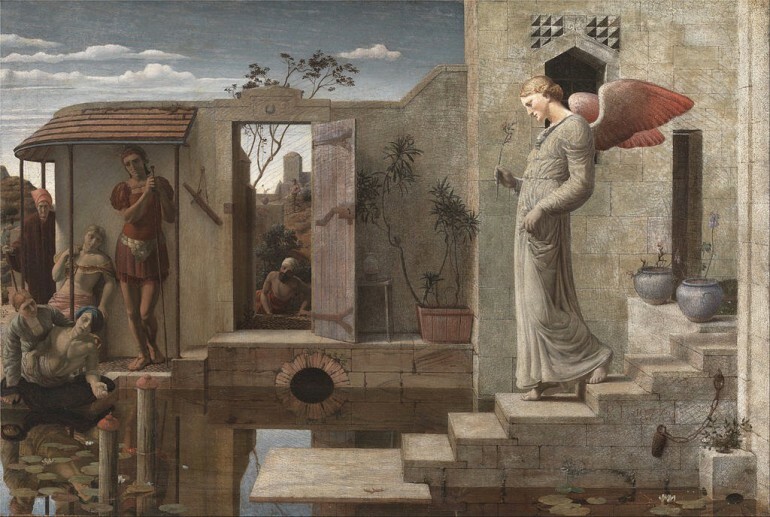 The first person to get in the water after the angel appeared would be healed of any illness. The story, in John 5, tells us that many people came to the pool seeking healing. In 38 years, the man never made it into the water first. Read his explanation again. He was a victim. Symbolically, you could say that Jesus demonstrated the new covenant by showing us that salvation comes through him, spiritually, rather than the rituals of the old church. Spiritually, the story speaks to the human condition. Everyone is seeking something. Jesus’ question says a lot. “Do you want to be healed?” In scripture, many people came to Jesus seeking relief. The man at Bethesda did not come to Jesus, Jesus came to him. The man believed healing was possible but he had stopped expecting it. When we place our hope in something other than Jesus, we can easily find ourselves without hope at all. Later, Jesus found the man at the temple and said “See, you are well! Sin no more, that nothing worse may happen to you.” We don’t know the man’s sins. Like all of us, he was a sinner. We do know that he placed his faith in something other than Jesus and it let him down time and time again. There will be struggles in life. Sometimes they can be overwhelming. Persistence in our struggles is a matter of perception. In challenging times, you have a choice to wait for the next shoe to drop or to wait on the blessing that is coming. When you are in the midst of a challenge, the adversary will tell you to resign to your fate—that it just doesn’t get any better and there is no use in trying. The defeatist will believe the lie. The defeatist expects someone to beat him into the water. Begin each day by leaping into the pool expecting a blessing.